Many of us don’t use checks when we’re doing a grocery shopping or buying clothes anymore, but checks are still used widely in the corporate and commercial worlds. If your business uses checks to either make or receive payments, fraud should be a concern. Research suggests that credit card fraud is much more common than check fraud, but the impact of check fraud is often greater, especially for smaller businesses. The average loss reported by SMEs in the US was $150,000. Based on the fact that checks are a target for fraudsters, it’s worth considering how you could protect your business. One option is to use high-security checks. What exactly is a high-security check? A high-security check is a check that offers much greater security than a conventional check. These business checks boast a series of features, which are designed to prevent fraud and make it much more difficult for opportunists to target your business. Criminals are aware that many small and medium-sized businesses handle checks on a daily basis, and they often present easy pickings in comparison with other types of fraud. If you’ve got a standard check, there’s not a huge amount you can do to put up a metaphorical electric wire and prevent that check from being tampered with. A high-security check represents a much trickier proposition for a thief. Consider the difference between trying to break into a house that has a pretty picket fence and a home protected by electric gates, outdoor lighting, security alarms, a menacing guard dog and CCTV cameras. If you were a thief, you’d attempt to gain entry into the first house every single time. With checks, if a fraudster has got a choice between a basic, standard version or one that boasts all the security bells and whistles imaginable, they’re always going to take the easy option. Often, deterrents are the most effective form of defense. A high-security check is a much less appealing option, and if a thief decides not to try and modify or replicate that check, there’s no risk that your business will lose out. High-resolution borders and complicated color patterns: the key to preventing check fraud lies in the ability to make it as difficult as possible to tamper with or duplicate a check. With high-resolution borders and complex patterns of color, checks become much more difficult to copy and replicate. Foil holograms: foil holograms are a visible deterrent for thieves who are out to copy checks. Holograms feature internal security features, which make them virtually impossible to mimic. Chemical reactive ink: chemical reactive ink dissolves in acetone, increasing the security of personal and business checks. Anti-copy technology: high security personal checks and business checks utilize state of the art anti-copy technology to minimize the risk of check fraud. The aim is to make it as tricky as possible for criminals to use traditional copying machines and devices to replicate checks boasting high security features. 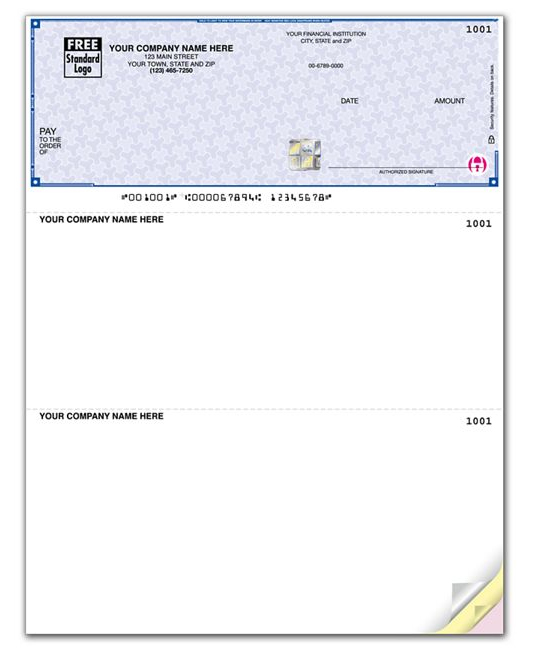 Watermarks: watermarks can be used to validate the viability of a check. They are visible when the check is held up to the light. False-positive testing areas: a high security check features a false-positive patch, which enables businesses and individuals to confirm the authenticity of the check by waving a black pen, which features a light, over the check surface. Heat-reactive ink: heat-reactive ink, known as thermochromic ink, can be used to verify the identity of a high security check and distinguish it from a forged check. Chemical wash detection fields: chemical wash detection fields are designed to identify and highlight attempts at chemical washing. UV ink: using UV ink helps to reduce fraud. Printing in UV is much more complex, and UV light will also smudge if the check is tampered with, for example, the payment amount is doctored. Are high security checks worth it? Why you should pay the extra cost. Check fraud is much more common than you may think. Many of us may not have used a personal check for years, but that doesn’t mean that checks aren’t still used widely. Businesses still deal in checks, and there are still many opportunists out there who are looking to line their pockets by replicating or tampering with checks. One of the main issues with check fraud is that doctored checks aren’t easy to spot. Thieves use sophisticated techniques to produce fraudulent copies that look incredibly similar to the original, and it’s very easy to fall into the trap of thinking that a check is authentic when it’s not. In a list of the ‘top 10 most risky scams’ published by the Better Business Bureau, check fraud came in at number two. Only home improvement ploys proved more prevalent. The list was compiled according to how many people are targeted by scammers, the likelihood of falling for the trick and the impact of the scam. If you deal with high security business checks, there’s a much lower risk of losing money and potentially having your brand image and reputation ruined by scammers. High security checks are packed with features that make life much more complex and challenging for criminals. In an age when it’s difficult enough to keep a business above water, it’s often best to adopt the mantra that prevention is better than cure and do whatever possible to protect your business. It’s better to spend money on robust, reinforced checks that are virtually impossible to doctor or copy than to find yourself in a situation where check fraud costs you hundreds or thousands of dollars. It’s very easy to order online, and you can choose from different prices and custom features. If you run a business or you use personal checks, it’s important to be aware of the risk of fraud. Although checks are not used as frequently as they once were, they are often an easy target for fraudsters. Using high security checks will give you peace of mind, as well as reducing the risk of facing potential financial ruin.